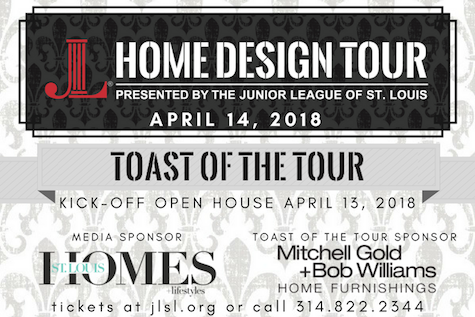 The tour will run from 9 a.m.-4 p.m. and will kick off on Friday, April 13, 2018 from 6-9 p.m. at the Toast of the Tour Open House at Mitchell Gold + Bob Williams store at Plaza Frontenac. Tickets will be available for purchase at all homes on the day of the event and are non-refundable. Payment will be accepted in cash, credit card or by check made payable to the Junior League of St. Louis. No refunds after Monday, April 9, 2018 at 5 p.m. Strollers are NOT permitted inside the homes. One guidebook (containing a detailed map with addresses) will be provided along with a wristband. The wristband will serve as your ticket for admittance into the homes. Booties will be provided at each home. Tour attendees are required to wear the booties upon entering the homes and removing them prior to leaving.